I’ve been embarrassed about something for many years. I’ve lived in Utah for half of my life, but never experienced “The Greatest Snow On Earth” on skis. This all changed last week when I learned how to ski at Park City Mountain Resort. Needless to say, it was an awful experience. I didn’t know the basics of how to actually keep myself upright on skis. I fell when getting off the lift. I fell trying to get to a place to learn the basics, and he still didn’t do a good job teaching me. As soon as I started to move down the hill, I always fell within 30 seconds. I fell and fell and fell. I didn’t know the proper way to take off my skis or get up after falling. I fell so much that Steve got bored and took off down the hill to have some “fun” before dealing with me again. I made it about halfway down the hill in 45 minutes, flagged down the ski patrol guy on a 4-wheeler, and asked to be driven down the hill. With an experience like that, and years of poor health, I didn’t expect to ever actually learn to ski. My “learning to ski” outing was a part of a retreat for Social Media Club of Salt Lake City board members. I said that I’d love to go skiing, but didn’t know how, so our fearless leader Krista set me up to take the Never Ever Half Day lesson. I came prepared, unlike my first time skiing. I had the proper layers, ski pants, socks, goggles, gloves, hat, and jacket. I arrived at PCMR around noon, got set up with my rental for boots, skis, and poles. I hobbled outside in my boots, found the area with the instructors, and found my group. I learned to ski with a girl from northern California and 3 people from Chicago. 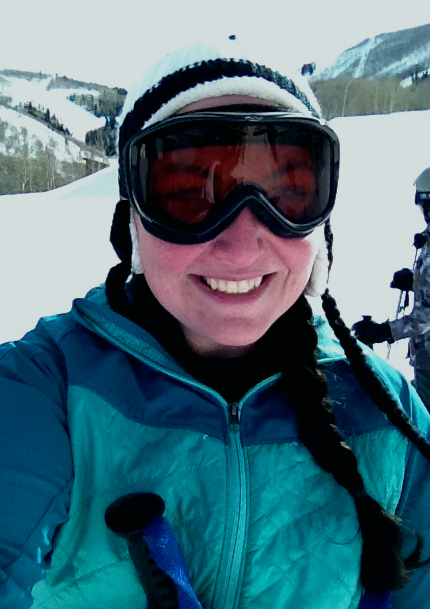 I can’t lie…I felt a little embarrassed to be the only one living in Utah who had never learned to ski. We started out with “babysteps” – gliding around a flat area on one ski, figuring out how to turn around, and how to balance. Once the second ski was on, it started to feel like something I’d be able to do. We practiced maneuvers in an area that wasn’t too steep or busy, and hopped on these cool conveyor belts to take us back up to the top of the practice area. After about 90 minutes of instruction, we were finally able to hop on the ski lift! After being on my feet for a while, it was nice to relax for a few minutes riding the lift. And of course, the view was amazing. I lucked out by going on a day with gorgeous blue skies and puffy white clouds. It was windy and cold, but not too cold. At the top of the hill, I felt inspired to quote the ski scene from one of my favorite movies – Better off Dead. The group followed our instructor to a part of the hill that wasn’t too busy, and our first run went well. When I was at the bottom of the hill..I couldn’t believe that I made it down the hill without any epic crashing nor burning. I did it! During the day, we made 5 runs down the mountain as a group. 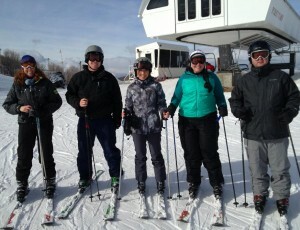 Surprisingly, I wasn’t the worst skier in the group, and I was comfortable skiing faster by my third run. But because I was getting ahead of the group, I stopped for a moment to let people catch up. I was admiring the scenery, taking in the mountain air, and then suddenly I was on the ground. I lost focus just long enough for my skis to cross and fall over. It wasn’t easy on my pride to fall over, but at least I only fell once. And I knew the proper technique to take off my ski and get up on my feet. Skiing is a lot more physically taxing than a regular workout. I typically work out 3-6 times a week at the gym, but skiing just trashes your muscles. Around the 3 hour mark, I was tired. And thirsty. And began feeling symptoms of reactive hypoglycemia. I had plenty of food and drinks in the car, but not with me on the slopes. I asked the group if anyone had food on them, and a girl dramatically whips out a banana and says “I’ve got a banana in my pocket!” I had a few nibbles, and took a break at the bottom of the hill. My instructor had some almonds, so the group took a breather and I gobbled down my snacks. Between the rest and food, I was feeling refreshed enough to do one last run. At the top of the hill, I had to take a good photo of myself. Victories like this don’t happen everyday. I’d like to say “If I can do it, anyone can do it.” But that’s not quite true. 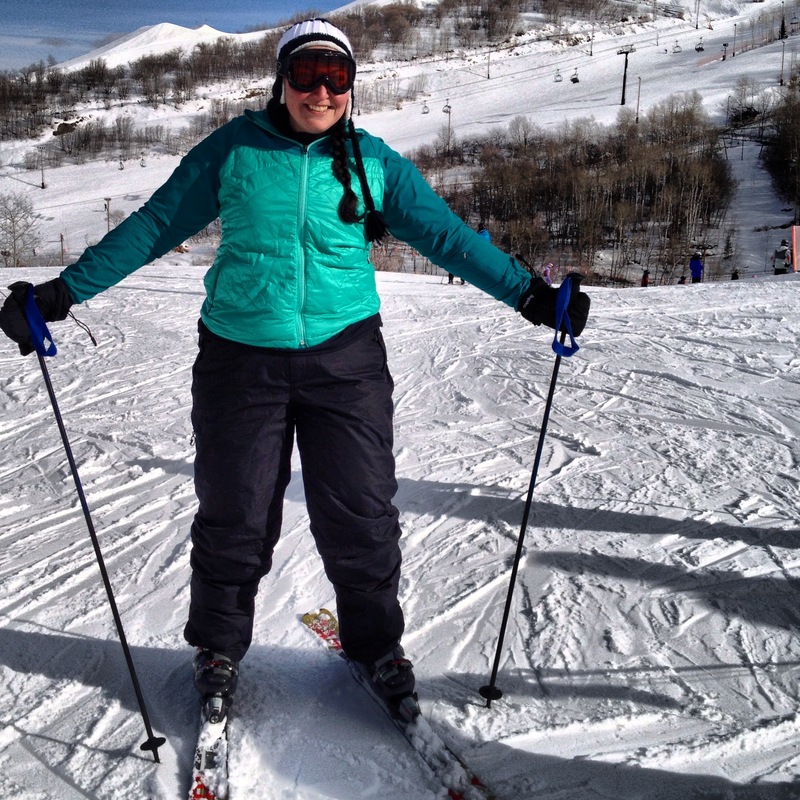 If you’re going to learn to ski, make sure that you’re in the habit of being physically active. If you’re fairly sedentary, you probably will get tired quickly and your body will hate you. I’m in the habit of frequent activity, and I was in AGONY for days. For the first two days, I did lots of stretching, loaded up on protein, and guzzled as much water as possible, but there was no way of getting around the pain. Especially because I can no longer take NSAIDs because of my gastric bypass. Tylenol only works so well on inflammatory muscle pain. 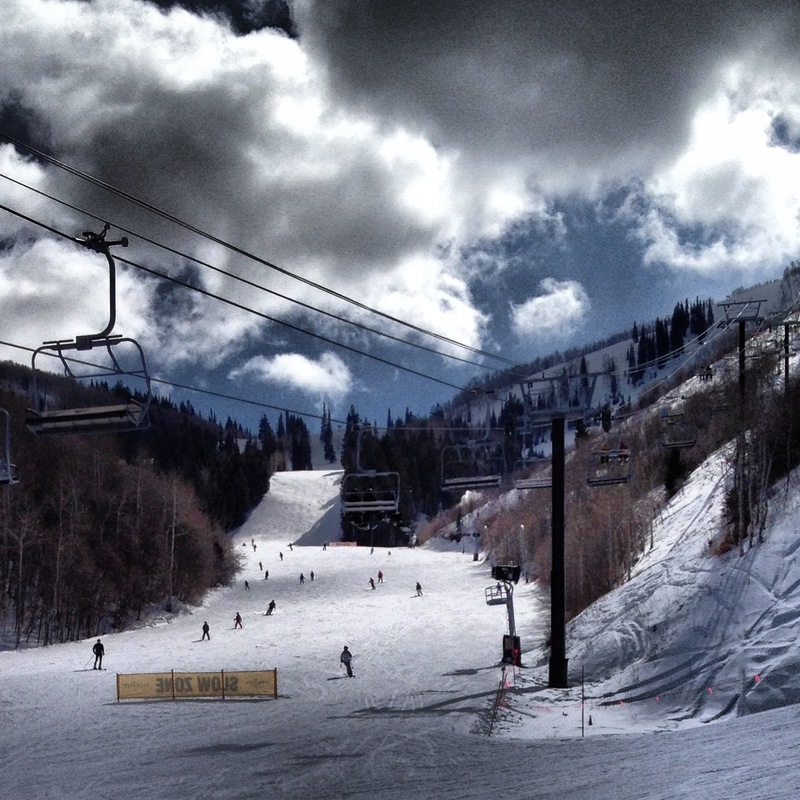 If you’re in Utah and want to give skiing a try, I’d love to go with you. Now I feel like I have an essential Utah activity in my skill repertoire. Yay!!!!!! I am so proud of you! We are going to have to go on a small dare-devil tour when I’m ready. Sky diving, skiing, how about snorkeling? windsurfing? and whatever else we can think of!!! You make a great snow bunny! Boy did this bring back memories. I’ve only tried skiing once. I went with my brother. He left me on the bunny slope and disappeared…which was fine with me. I was falling down every couple minutes but I was having fun. Then he came back to ‘teach’ me…which consisted of him yelling at me till I cried (I was a teenager). I gave up by midday and spent the rest of the day in the car waiting to go home. Maybe, if I ever lose this weight I’ll try again. This is crazy, because I had a nearly identical experience! I lived in Utah for most of my life, and decided as an adult it was ridiculous that I have not snowboarded. Tried it, failed. Hard. And now I live in Los Angeles and never take my kids to the beach. I’m going to after my RNY. I swear it.